Organized youth sport became popular in the 1920s (in the United Kingdom, at least) in part based on the idea that sport could help to produce well-grounded, physically strong, morally sound boys who would be successful contributors to society, particularly in the military and business worlds. In contemporary societies, there are competing reasons for promoting participation in youth sport. For example, some people primarily view youth sport as a breeding ground for the next generation of elite athletes. Others focus more on the potential psychological, social, and emotional benefits of youth sport participation, while acknowledging that sport participation has also been associated with negative outcomes. Additionally, youth sport has been viewed within a population health context. That is, declining participation in active free play and active transportation account for a large proportion of the low levels of youth physical activity observed in most developed countries. Sport has therefore become one of the primary vehicles through which children and adolescents engage in physical activity. Hence, youth sport maintains an important role in modern society, but reasons for promoting youth sport vary. Specifically, viewing sport as a breeding ground for talent versus a context for physical activity promotion and youth development may not be entirely compatible. Given these competing reasons it is perhaps not surprising that there are multiple systems of youth sport delivery that create a complex landscape. For example, there are publicly funded recreational community-based leagues, competitive clubs, school teams, specialized school-based academies, elite private training programs, regional and national development teams, and the youth team structures of professional sport clubs. Unfortunately, researchers have largely been unable to delineate the different types of outcomes associated with participation in different types of sport programs. Programs vary in terms of the amount of adult involvement and level and intensity of competition. Recreationally oriented programs are typically run by committed volunteers (many of whom are parents), with a primary focus on providing opportunities to play and the development of skills and tactics occurring incidentally. More competitive programs often include professional coaches and specifically focus on developing physical skills, technique, and tactical understanding. Sport sociologist Jay Coakley argued the term youth sport has become synonymous with organized competitive programs that have become increasingly privatized and subject to adult control. Although trends in overall physical activity participation have been relatively well documented, less attention has been given to youth sport participation rates. Nonetheless, from the available international data it appears that in developed countries between 50% and 70% of youth participate in at least one sporting activity annually. 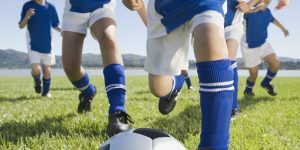 A study from Australia showed 63% of children (ages 5–14 years) participated in organized sport within the previous year; a study from the United Kingdom revealed 59% of boys and 55% of girls (ages 2–15 years) participated in sports at least once a week; Canadian statistics showed that in 2005, 51% of children and adolescents regularly participated in sport; and data from the United States showed that 54% of all high school students participated in sport during the 2006–2007 school year. Finally, data also show that sport participation peaks during late childhood before sharply declining during the middle and late adolescent periods. Despite these relatively high rates of sport participation, caution must be used when drawing conclusions from these data. In some surveys, respondents (often parents or caregivers rather than their children) report children’s participation in sport once in the last year, while in other surveys require to report sport participation in the last week or month. Some studies include school sport, whereas others only focus on sport occurring outside of school (which is likely to be more indicative of regular commitment to youth sport). Finally, in some studies, all the sports in which an individual participates are reported, meaning that a single person who plays multiple sports may be counted more than once when tallying sport participation. Combined, these measurement issues may mean that youth sport participation rates are artificially inflated. Standardized measurements, definitions of youth sport, and regular surveys are required to ensure researchers and policy makers have a detailed and accurate knowledge of sport participation rates. There are numerous inequalities in youth sport participation. In many developed countries, sport participation continues to be lower among females compared to males. There are also differences in youth sport participation in relation to socioeconomic status, family structure (one or two-parent families), and ethnicity. Children from families with higher economic status and higher education levels tend to have more access to sport. Given the increasing privatization of youth sport and reduction of publically funded programs in many countries, the cost of youth sport has become a barrier to participation. Organized youth sport maintains an important role in contemporary society. Although programs have become more privatized and adult controlled, international participation rates are relatively high and stable. That said, inequalities relating to gender, socioeconomic status, and education levels persist. In the future, it may be important to reduce these inequalities by providing greater access and opportunities to people from a range of different backgrounds and working with administrators, coaches, and parents to help ensure the conditions for more consistently promoting positive outcomes are provided. Coakley, J. (2009). Sport in society: Issues and controversies (10th ed.). New York: McGraw-Hill. Knight, C. J., & Holt, N. L. (2011). Sport participation during childhood and adolescence. In N. L. Holt & M. Talbot (Eds. ), Long term engagement in sport and physical activity: Participation and performance across the lifespan (pp. 9–18). London: Routledge & International Council of Sport Science and Physical Education.